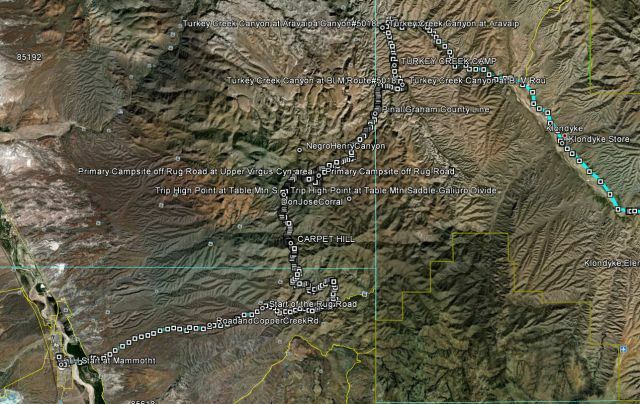 The rug road is an old road that connects the Arivaipa Canyon to the San Pedro River Valley. It is rumored that sometime in the 1950's a rancher from the Arivaipa side enhanced this road at a particularly steep section of hill climb by putting in some carpet remnants to aid in traction for his two wheel drive pickup. I can't fathom doing any of this trail in a 2WD. The addition of these carpet pieces into that high shear force hillside designated that section as 'Carpet Hill' and the entire road as the "RUG ROAD". The trip ends in beautiful Turkey Creek and Arivaipa Canyon. This is NOT recommended as a 1 day trip. This is NOT recommended as a solo trip. Stock: Possible but NOT recommended - Higher than normal Ground Clearance needed. The road starts out in Mammoth, and there is a sign in book as you will be crossing lots of private land. (Sign it so we can keep this trail open) it follows a wash for several miles then itclimbs several hills and undulates over ridge and canyon for about 25 miles. There will be many interesting sights to stop at and explore. This is the toughest obstacle on the entire trail - a 1 mile 700' down hill shelf road that is littered with basketball size boulders that have to be negotiated, all while the passenger gets to look at the significant drop off on their side. Pucker factor will be high and you will be in 4WD-Low-1st here. a 40 degree down hill with two 90 degree turns. There IS a parking area at the top so that you can walk and plan it. (But not when coming E-W which makes this a difficult climb and the drop off will be on the driver's side). It's unnerving to get a bounce off a boulder toward the side of the shelf road. After Carpet Hill and the descent of Boulder Mountain - you climb up all the distance you dropped to the Table Mountain Saddle. From here the views are STUNNING and you can get Cell Phone reception for those final goodbyes. After the saddle, you can visit the ruins of the Table Mountain Mine, Office and Smelter complete with boiler remnants and 2 furnaces. From here you drop down into Parson's grove which had a cabin, a small pond and a corral. This would be a nice place to stop and camp if you are running out of daylight. 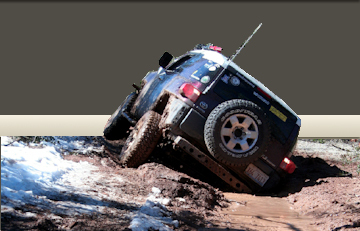 3.5 - Challenging 4WD trail: Challenging trails on which low range 4WD is required. You will encounter a variety of more difficult challenges (loose rocks, large potholes, steep inclines, and large rocks) on these trails. Not recommended with stock 4WD vehicle. Traction device (limited slip) in rear differential, aggressive tread and low air pressure highly recommended. Higher than stock ground clearance is advisable. Moderate experience and driving skill advised. Likely paint damage, possible rocker-panel damage. There are lots of climbs involving loose 'scree' broken shale and baseball size rocks. your tires will NOT be happy at the end of this run. There will be several points that your ascent will fail and you will have to choose a new line. As you approach Turkey Creek, you will encounter 3 steps that must be driven down that are 3' plus. There are two steps that will be climbed that are 3'plus. You drop out of the ridges rather abruptly into Turkey Creek. This is a 10 mile long, 100' high, cliff wall slot canyon that has HUGE cotton wood and Oak trees. There are some minor water collections this time of year (Spring) that will be crossed. The road here is easy and we all switched back into 2WD for some of it. (It can be Quite Dusty though so space your vehicles accordingly). Makes one wonder how many more there are undiscovered hanging off the cliff walls in Turkey Creek. The trail follows the bottom of the canyon to the point where it intersects with Arivaipa Canyon. Arivaipa Canyon is owned by the Nature Conservancy and as such none of the old buildings or sides of the road are accessible to the public. It is, however, more than extraordinarily beautiful in that canyon. You can air back up near Klondyke Store (Now closed and for sale). From here - it's about 3 miles south to the turn off where the Phoenix and Tucson parties will split. Tucson - Heads East to Bonita - then South to Willcox (First Fuel availability). About 3 hours from this point to Tucson. The entire trip from my house to my house was 232 miles but the actual Mammoth to Klondyke portion is about 33 miles. I burned 1/2 tank fuel on this 25 miles because I rarely was higher than 2nd Gear (MT6) the whole off-road portion of the trip. The last 10 Miles are in Easy canyon bottom and can be done in 2WD (there are 6 water crossings that would be better taken in 4WD). While actual elevation difference on the route is only a bit more than 3,000 feet, the accumulated elevation gain (from all the up and down) is more than 8,400 feet. No one has gone over and back in a day. YOU SHOULD CARRY at least 5 gal EXTRA FUEL as there is NOT an easy fill up place on the East side. You can top off at the circle K in Mammoth at the start. You will need 6gal/water /person. (Filtering on the Turkey creek side is possible). Start point of this trail is off MAIN street in Mammoth. OR if going E-W, Arivaipa Canyon Wilderness near Klondyke. Great write up, this is on my to do list for sure. now a question for you....how would my long wheelbase 70 suburban do? Great writeup! I definitely have this one on my list of to-do's. This was a particularly nasty obstacle stablized with tires in the road side, wasn't that bad this time. But this is a very wash out prone dip in the trail. Thanks for the time/effort to put this together. Looks like a fun trip and something I'd like to do. Has anyone tried this recently? A few of us are going to be in the area mid March. Is there still no GPS file for this trail? I'm gonna do it with a buddy on Saturday and Sunday, and hate having to take GPS coordinates and plug them all in Google Earth to make a file I can export to my app on my phone, but will do if there isn't one. I just have to say, I hate that downhill section from the top of rug road! Talk about pucker factor for sure!!! We turned around shortly after that section of the trail as it was going to be an out and back in one day trip. I can rustle one up for you. BTW, there's a gpx at the bottom of the Original Post. So when I was first looking, I wasn't logged in and didn't see it. However when I logged in to reply and now saw your response I see it.